Great Day for Pat Neshek. His son sees his first game! 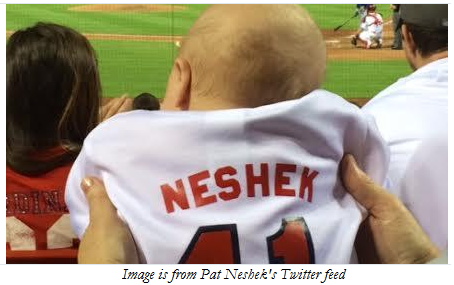 Pat Neshek and his wife Stephanie were like any other excited parents back in 2012 when their son, Gehrig John was born. Pat is a Major League baseball player who was playing for the Oakland A’s then. He flew in for the birth of his baby. Unfortunately, the baby died 23 hours later. It was a horrendous time for the Nesheks, as they were getting text messages congratulating them, the two were weeping. So, he had to post on Twitter (seen below). On the baseball front things were not looking good for Pat either. As of February of this year, he didn’t have a team on which to play. At 33 years old, he is no spring chicken in baseball years. And, career-wise he had never been an All Star pitcher. So, what was his future? He was not a glamorous starting pitcher. He was not an overpowering closer. He is a set up man who comes out of the bullpen for few batters. At this point it appeared several Major League teams said, “no” to his services. That is until the St. Louis Cardinals stepped in February of this year, essentially 18 months after Gehrig John has passed away. Now with a new team, in March of 2014, Pat and Stephanie gave birth to another baby boy, Hoyt Robert – now glowing parents appreciating every moment. Something amazing happened with Pat’s career as a pitcher. No one could hit him. He has been pitching lights out. The position that Pat plays usually doesn’t get any All Star recognition. That’s why it’s so special for him to be nominated to the 2014 All Star Game. Another special twist is that the game is being played in his home state of Minnesota. The nomination was so special to Neshek at “Media Day,” he was either smiling brightly or tearing up. He said, “I don’t think anyone else here appreciates it as much as me.” Read about it here on CBS Sports.com and here is a story in the USA Today. 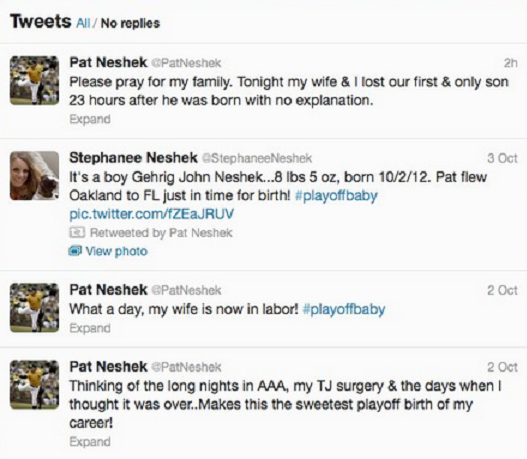 Pat Neshek’s Twitter Feed after he and his wife lost their baby.